...still considered the Circus as their home, their temple, and the seat of the republic. The median strip was called the spina and usually featured ornate columns, statues and commemorative obelisks. The turning points on either end of the spina were usually marked by conical poles, called the metae (singular: meta). The performance surface of the circus was normally surrounded by ascending seating along the length of both straight sides and around the curved end, though there were sometimes interruptions in the seating to provide access to the circus or the seating, or to provide for special viewing platforms for dignitaries and officials. One circus, that at Antinopolis (Egypt), displays a distinct gap of some 50m between the carceres and the start of the ascending seating where there is apparently no structure. This appears to be an exception. The great majority of circuses fit the description above. Those that do not display two different variations: that at Emerita Augusta (Mérida, Spain), where the carceres end is substituted by a slightly curved 'straight' end joined to the straight sides of ascending seating by rounded corners of ascending seating; and a few in which the carceres end is substituted by a second semi-circular end to produce an oval shaped arena. These latter circuses are normally small (Nicopolis (Greece) and Aphrodisias (Turkey)), and should probably be considered stadiums. There are similar buildings, called stadia, which were used for Greek style athletics. These buildings were similar in design but typically smaller than circuses; however, the distinction is not always clear. An example of this type is the Stadium of Domitian. Differently from other major Roman structures circuses frequently evolved over long periods of time from a simple track in a field, through generations of wooden seating structures (frequently destroyed by fire or rot), before they finally began to be converted to stone. Although circuses such as the Circus Maximus (Italy) may have existed in some form from as early as around 500BC, circuses were mainly constructed during the 400 years between 200BC and 200AD. The comparative dimensions of a circus may be measured in 2 basic ways: by the length of the track, and by the seating capacity. Other dimensions, such as the external dimensions of the structure may vary considerably depending on the location, the site, and on specific architectural characteristics. The simplest comparative measurement of a circus is its track length. This is the most easily measured dimension, as it only requires small excavations at either end of the centreline. It is very probable that this can be done even when the circus is buried under subsequent constructions. Track lengths may vary from the 245m of the circus at Gerasa (Jordan), to the 621m of the Circus Maximus (Italy). The alternative comparative dimension is that of seating capacity. This is much more complex to measure as it requires that the dimensions of the original vertical and horizontal extent of the inclined seating be re-established. In many cases the full structure of the inclined seating has been destroyed beyond the point where this can be measured, or at the least would require a great deal more excavation than that required for the measurement of the track length. Seating capacity may vary from around 15,000 people at Gerasa (Jordan), to 150,000 at the Circus Maximus (Italy). Circuses do not appear to have been constructed with any special compass orientation. Those that are well identified can be found with their round ends oriented around the compass. Examples include: N. Gerasa (Jordan); NE. Antinopolis (Egypt); E. Circus of Maxentius (Italy); SE. Circus Maximus (Italy); S. Tyrus (Lebanon); SW. Gortyn (Greece); W. Circus of Nero (Italy). outside the city walls at anything up to 1.5 km distant, as at: Gerasa (Jordan) (c300m), and Leptis Magna (Libya) (1.5 km). simply within the town walls, as at: Thessalonica (Greece). inside the walls, in the heart of the town, and an integral part of the architectural power structure of the town, as at: Rome, Sirmium (Serbia) and Tarraco (Spain). The carceres, or starting gates, had a distinctive, slanted, slightly curved, plan form, designed to compensate for what would otherwise be significant differences in the distances from the individual starting gates to the start of the first section of straight track on the right hand side of the spina (as seen from the carceres). The carceres were designed for the races to be run round the spina in an anticlockwise direction. The form of the carceres appears to have been standardised throughout the Roman world. The similarity in form among the carceres of circuses of many different sizes suggests that carceres were constructed according to a series of proportional mathematical relationships or formulas. It is not clear when the earliest carceres of the standardised form was constructed, nor whether there exists documentary evidence for the existence of such formulas. Some of the best examples of carceres can be found at: Gerasa (Jordan) and the Circus of Maxentius (Italy). The best preserved circuses include: Emerita Augusta (Spain), Caesarea Maritima (coastal) (Israel), Circus of Maxentius (Italy), Gerasa (Jordan), Tyrus (Lebanon), Miróbriga (Portugal), Leptis Magna (Libya). Unless otherwise indicated the coordinates in the following list are of a point that lies within the space of a circus. For the remaining circuses (those whose detailed location is not known) the point is for a location within the space of the historic nucleus of the associated town, or for a location within the associated archaeological site. These points are probably within 1.5 kilometres of the site of the circus, as a circus was almost always within this distance from its associated town. Auzia Sour El-Ghozlane (= pre-independence Aumale) Alg-aAlgeria 36°08′53″N 3°41′27″E﻿ / ﻿36.14799°N 3.690924°E﻿ / 36.14799; 3.690924﻿ (Auzia (Sour El-Ghozlane) (not the circus; historic nucleus of current town)) (not the circus; historic nucleus of current town) 000(location_unknown)cited in Humphrey; no online circus-specific information found. Saldae Béjaïa Alg-s1Algeria 36°45′18″N 5°05′02″E﻿ / ﻿36.755068°N 5.083765°E﻿ / 36.755068; 5.083765﻿ (Saldae (Béjaïa) (not the circus; historic nucleus of current town)) (not the circus; historic nucleus of current town) 000(location_unknown)cited in Humphrey; no online circus-specific information found. 000(location_unknown)cited in Humphrey; no online circus-specific information found. Antinopolis Mallawi (c10km) Egy-a2Egypt 27°48′36″N 30°53′08″E﻿ / ﻿27.810092°N 30.885503°E﻿ / 27.810092; 30.885503﻿ (Antinopolis Roman circus) 325cited in Humphrey; visible track length: 300–350 m; visible track width: c45m; U-shaped; the carceres are c50m beyond the ends of the ascending seating at the open south-west end; clearly visible and unobstructed. Oxyrhynchus Beni Mazar (c15km) Egy-oEgypt 28°32′09″N 30°39′19″E﻿ / ﻿28.535969°N 30.655336°E﻿ / 28.535969; 30.655336﻿ (Oxyrhynchus (not the circus; archaeological site of Roman town)) (not the circus; archaeological site of Roman town) 000(location_unknown)cited in Humphrey; no online circus-specific information found. Camulodunum Colchester Eng-cEngland 51°53′01″N 0°53′53″E﻿ / ﻿51.883604°N 0.898175°E﻿ / 51.883604; 0.898175﻿ (Camulodunum (Colchester) Roman circus) 450location information; archaeological information; official archaeological information; length: c450m; width: c75m. (Colonia Iulia Paterna Arelatensium Sextanorum) Arles Fra-aFrance 43°40′24″N 4°37′07″E﻿ / ﻿43.6734°N 4.61855°E﻿ / 43.6734; 4.61855﻿ (Arelate (Arles) Roman circus) 450cited in Humphrey; official archaeological information; c40% of curved south-west end is minimally visible; the remaining structure lies to the north-east under a road junction and housing; length: c450m; width: c101m; visible track width: c80m. Lugdunum Lyon Fra-lFrance 45°45′26″N 4°48′55″E﻿ / ﻿45.757314°N 4.815188°E﻿ / 45.757314; 4.815188﻿ (Lugdunum (Lyon) Roman circus (approximate hypothesised location)) (approximate hypothesised location) 001(hypothesised_location)cited in Chase; hypothesised location. Mediolanum Santonum Saintes Fra-mFrance 45°44′47″N 0°38′00″W﻿ / ﻿45.7464°N 0.6333°W﻿ / 45.7464; -0.6333﻿ (Mediolanum Santonum (Saintes) Roman town (not the circus; historic nucleus of the town)) (not the circus; historic nucleus of the town) 000(location_unknown)cited in Humphrey; no online circus-specific information found. Vienna Vienne Fra-vFrance 45°30′59″N 4°52′06″E﻿ / ﻿45.516492°N 4.868196°E﻿ / 45.516492; 4.868196﻿ (Vienna (Vienne) Roman circus) (possibly very approximate; the satellite image at this location is extremely distorted) 002(approximate_location)Cited in Humphrey; the only remaining feature is a monumental arched structure topped by a tall, narrow, pyramid; this structure was on the spina. Augusta Treverorum Trier Ger-aGermany 49°45′04″N 6°38′55″E﻿ / ﻿49.751175°N 6.648531°E﻿ / 49.751175; 6.648531﻿ (Augusta Treverorum (Trier) Roman circus) 450Cited in Humphrey; location; plan of Roman town showing location of circus; length: c450m. Corinth (Colonia Iulia Flavia Augusta Corinthiensis) Corinth Gre-cGreece 37°54′35″N 22°52′33″E﻿ / ﻿37.909792°N 22.875938°E﻿ / 37.909792; 22.875938﻿ (Corinth Roman circus (hypothesised and partially excavated location)) (hypothesised and partially excavated location) 002(approximate_location)discussion about the evidence for a circus; plan showing the hypothesised location of the circus and; hypothesised and partially excavated location. Nicopolis Preveza (c7km) Gre-nGreece 39°01′25″N 20°44′05″E﻿ / ﻿39.023563°N 20.734805°E﻿ / 39.023563; 20.734805﻿ (Nikopolis Roman circus) 215referred to as a stadium; very small for a circus; visible track length: c215m; visible track width: c20m; double-U-shaped plan form with both rounded ends clearly visible; the space is unoccupied by any modern structures. Thessalonica Thessaloniki Gre-tGreece 40°37′47″N 22°57′03″E﻿ / ﻿40.629669°N 22.950890°E﻿ / 40.629669; 22.950890﻿ (Thessalonica Roman circus) 525Cited in Humphrey; archaeological information about the town; location (the circus is marked 'Ancient Hippodrome'); archaeological map of historical centre of town, showing location of hippodrome/circus (in Greek; hippodrome = Ιππόδρομος); approximate length inferred from and: c525m. Caesarea Maritima (coastal) Caesarea Isr-c1Israel 32°29′55″N 34°53′26″E﻿ / ﻿32.4986°N 34.8906°E﻿ / 32.4986; 34.8906﻿ (Caesarea Maritima (Caesarea) coastal Roman circus) 290cited in Humphrey; referred to as a hippodrome; on the coast; parallel to the coast; visible track length: c290m; visible track width: c45m; U-shaped plan form clearly visible; structure substantially complete; few modern structures constructed within the space. Bovillae Frattocchie-Boville Ita-bItaly 41°45′27″N 12°37′18″E﻿ / ﻿41.757499°N 12.621679°E﻿ / 41.757499; 12.621679﻿ (Bovillae Roman circus) 328cited in Humphrey; (Italian); information and photos in English; (track?) length: 328.50m; (track?) width: 60m; location centred on the only visible remains – three stone arches (part of the carceres). Mediolanum Milan Ita-m1Italy 45°27′48″N 9°10′48″E﻿ / ﻿45.463276°N 9.179936°E﻿ / 45.463276; 9.179936﻿ (Mediolanum (Milan) Roman circus) 460Cited in Chase; location; track length: 460m; track width: 67/68m; the principal visible remains are a tower at the north western corner of the circus; the main body of the circus lay SSE of this tower. Circus Flaminius Rome Ita-r1Italy 41°53′34″N 12°28′39″E﻿ / ﻿41.892758°N 12.477422°E﻿ / 41.892758; 12.477422﻿ (Circus Flaminius, Rome) 380Cited in Humphrey; it is not entirely clear whether this 'structure' was, in fact, a circus or stadium of the form of the others in this list; Wikimapia location; estimates of size are: length 260–500 m, width 100m. Circus of Maxentius, a.k.a. Circus of Caracalla Rome Ita-r2Italy 41°51′17″N 12°31′21″E﻿ / ﻿41.854645°N 12.522411°E﻿ / 41.854645; 12.522411﻿ (Circus of Maxentius, Rome) 490Visible track length: c490m; visible track width: c80m; form clearly visible; U-shaped; the space is unoccupied by any modern structures; many parts of the structure are visible. Circus Maximus Rome Ita-r3Italy 41°53′10″N 12°29′07″E﻿ / ﻿41.886016°N 12.485404°E﻿ / 41.886016; 12.485404﻿ (Circus_Maximus, Rome) 621Track length: c621m; track width: c150m; form substantially visible; U-shaped; the space is practically unoccupied by any modern structures; only a few parts of the structure are visible or remain. Circus of Nero, a.k.a. Circus of Caligula, or Vatican Circus Rome Ita-r4Italy 41°54′06″N 12°27′19″E﻿ / ﻿41.901638°N 12.455256°E﻿ / 41.901638; 12.455256﻿ (Circus of Nero, Rome) 002(approximate_location)Cited in Humphrey; location just to the south of St. Peter's Basilica well established, though exact position and orientation unknown; the only surviving remains are the obelisk which was brought from Egypt to adorn the spina in 37 AD; the obelisk was moved to its current location in Saint Peter's Square in 1586. Gadara Umm Qais Jor-g1Jordan 32°39′25″N 35°40′01″E﻿ / ﻿32.656914°N 35.666857°E﻿ / 32.656914; 35.666857﻿ (Gadara Roman hippodrome) 002(approximate_location)Cited in Humphrey; a German language archaeological site map of Gadara indicates a location for what is described as a hippodrome. Gerasa Jerash Jor-g2Jordan 32°16′25″N 35°53′27″E﻿ / ﻿32.273655°N 35.890730°E﻿ / 32.273655; 35.890730﻿ (Gerasa Roman circus) 245cited in Humphrey; visible track length: c245m; visible track width: c50m; form clearly visible; U-shaped; the space is unoccupied by any modern structures; a great deal of the structure still stands. Beirut Hippodrome Beirut Leb-bLebanon 33°53′52″N 35°29′59″E﻿ / ﻿33.897911°N 35.499584°E﻿ / 33.897911; 35.499584﻿ (Colonia Iulia Augusta Felix Berytus (Beirut) Roman hippodrome) 002(approximate_location)cited in Humphrey; the location is of the archaeological site of the Beirut Hippodrome as given on Wikimapia; this may, or may not, be the same structure as the circus. Tyrus Tyre Leb-tLebanon 33°16′06″N 35°12′35″E﻿ / ﻿33.268313°N 35.209776°E﻿ / 33.268313; 35.209776﻿ (Tyre Roman circus) 435cited in Humphrey; visible track length: c435m; visible track width: c80m; form clearly visible; U-shaped; the space is unoccupied by any modern structures; a great deal of the structure is still visible. Aeminium Coimbra Por-aPortugal 40°12′32″N 8°25′31″W﻿ / ﻿40.209016°N 8.425387°W﻿ / 40.209016; -8.425387﻿ (Aeminium (Coimbra) Roman town (not the circus; nucleus of the Roman town)) (not the circus; nucleus of the Roman town) 000(location_unknown)believed to have existed, but unconfirmed; archaeological information about the Roman town; reference to a suggested location for the circus (Praça do Comércio); suggested location. Balsa Tavira Por-bPortugal 37°05′26″N 7°41′07″W﻿ / ﻿37.090488°N 7.685301°W﻿ / 37.090488; -7.685301﻿ (Balsa (Tavira) Roman circus) 375cited in Humphrey; the location is approximately that indicated conjecturally, though with considerable certainty, at; that site states "the topographic marks of [the circus] permit a reasonably rigorous survey"; length: c375m; width: c80m. Olissipona Lisbon Por-oPortugal 38°42′50″N 9°08′21″W﻿ / ﻿38.713788°N 9.139192°W﻿ / 38.713788; -9.139192﻿ (Olissipona (Lisbon) Roman circus) 002(approximate_location)in what is today the 'Rossio'; an account (in Portuguese) of excavations which uncovered a section of the spina of the circus can be found at. Sirmium Sremska Mitrovica Ser-sSerbia 44°58′03″N 19°36′44″E﻿ / ﻿44.967364°N 19.612151°E﻿ / 44.967364; 19.612151﻿ (Sirmium (Sremska Mitrovica) Roman circus (approx)) 450cited in Humphrey; the location is a close approximation based on information at; length: c450m; width: c150m; the structure lies buried some 2–4 m under the current town centre, just to the north of the partially excavated palace; only very small sections have been excavated. Calagurris Calahorra Spa-c1Spain 42°18′17″N 1°57′47″W﻿ / ﻿42.304811°N 1.963025°W﻿ / 42.304811; -1.963025﻿ (Calagurris (Calahorra) Roman circus) 325cited in Humphrey; the circus lies under the pedestrian thoroughfare 'Paseo Del Mercadal'; length c300-350m. Cáparra Capera Spa-c2Spain 40°10′01″N 6°06′04″W﻿ / ﻿40.166847°N 6.101135°W﻿ / 40.166847; -6.101135﻿ (Cáparra (Capera) Roman town (not the circus; nucleus of the Roman town)) (not the circus; nucleus of the Roman town) 000(location_unknown)cited in Humphrey; the location, from Wikimapia and Spanish Wikipedia is of the ruins of the Roman city only; there is no indication of the location of the circus. Corduba Córdoba Spa-c3Spain 37°53′06″N 4°46′22″W﻿ / ﻿37.885079°N 4.772803°W﻿ / 37.885079; -4.772803﻿ (Corduba (Córdoba) Roman circus) 370location from Wikimapia and others; length: c370m; entirely buried under the existing city centre; virtually no remains visible. Circus Maximus (Mérida) Mérida Spa-eSpain 38°55′12″N 6°19′56″W﻿ / ﻿38.920037°N 6.332116°W﻿ / 38.920037; -6.332116﻿ (Emerita Augusta (Mérida) Roman circus) 400Cited in Humphrey; visible track length: c400m; visible track width: c85m; form clearly visible; U-shaped but without the distinctive slanted 'flat' carceres end seen in many other circuses; instead the 'flat' end is slightly rounded; the space is unoccupied by any modern structures; much of the structure is still visible. Italica Santiponce Spa-s1Spain 37°26′19″N 6°02′22″W﻿ / ﻿37.43856°N 6.039444°W﻿ / 37.43856; -6.039444﻿ (Italica (Santiponce) Roman town (not the circus; nucleus of the Roman town)) (not the circus; nucleus of the Roman town) 000(location_unknown)cited in Humphrey; very approximate location; the circus lies under the centre of the existing old town of Santiponce; nothing is visible; note that the very large amphitheatre at Italica is sometimes referred to as a circus. Tarraco Tarragona Spa-t1Spain 41°07′01″N 1°15′21″E﻿ / ﻿41.116963°N 1.255832°E﻿ / 41.116963; 1.255832﻿ (Tarraco (Tarragona) Roman circus) 290cited in Humphrey; most of the circus lies buried under the existing town; a substantial part of the curved eastern end, and part of the south-western side, are visible; track length: c290m; track width: c75m. Toletum Toledo Spa-t2Spain 39°51′49″N 4°01′48″W﻿ / ﻿39.863689°N 4.029978°W﻿ / 39.863689; -4.029978﻿ (Toletum (Toledo) Roman circus) 430Cited in Humphrey; between a third and a half of the circus, including the round end, is partially visible; the remainder of the circus, has either been obliterated, or lies under modern constructions; suggested length: c430m; visible width: c75m. Zafra Spa-zSpain 38°25′25″N 6°24′58″W﻿ / ﻿38.423701°N 6.416107°W﻿ / 38.423701; -6.416107﻿ (Zafra town (not the circus; historic nucleus of town)) (not the circus; historic nucleus of town) 000(location_unknown)cited in Humphrey; there appears to be significant uncertainty about the status, and even name, of Zafra in the Roman era; the town appears to have no significant Roman remains other than those of some 20 Roman villas in the surrounding area; no online circus-specific information found. Laodicea ad Mare Latakia Syr-lSyria 35°31′11″N 35°46′30″E﻿ / ﻿35.519688°N 35.775046°E﻿ / 35.519688; 35.775046﻿ (Laodicea ad Mare (Latakia) Roman town (not the circus; historic nucleus of the town)) (not the circus; historic nucleus of the town) 000(location_unknown)cited in Humphrey; no online circus-specific information found. Abthugni Henchir Souar OR Henchir Esch Schorr OR Henchir es Souar Tun-aTunisia 36°11′52″N 10°00′32″E﻿ / ﻿36.197695°N 10.008889°E﻿ / 36.197695; 10.008889﻿ (Abthugni (Henchir Souar) Roman town (not the circus; nucleus of the Roman town)) (not the circus; nucleus of the Roman town). 000(location_unknown)cited in Humphrey; coordinates of place; location of place on topographic map (ref: NJ 32-15/510322); references to Henchir Souar; aerial photograph of place confirms coordinates reference; topographic features on aerial photograph match with; no online circus-specific information found. Circus of Carthage Carthage Tun-c1Tunisia 36°51′01″N 10°18′55″E﻿ / ﻿36.850222°N 10.315239°E﻿ / 36.850222; 10.315239﻿ (Carthago (Carthage) Roman circus) 500Cited in Humphrey; location; length: c500m; width: c90m; U-shaped; very little remains visible; partly occupied by modern constructions. Commodum OR Municipium Aurelium Commodum Henchir Bou Cha or Henchir Fraxine Tun-c2Tunisia 36°31′56″N 9°53′04″E﻿ / ﻿36.532221°N 9.884513°E﻿ / 36.532221; 9.884513﻿ (Municipium Aurelium Commodum (Henchir Bou Cha) Roman town (not the circus; nucleus of the Roman town)) (not the circus; nucleus of the Roman town) 000(location_unknown)cited in Humphrey; archaeological document of Tunisian government (French); location of place on topographic map (ref: NJ 32-15/498358); no online circus-specific information found. Hadrumetum OR Colonia Concordia Ulpia Trajana Augusta Frugifera Hadrumetina Sousse Tun-hTunisia 35°49′47″N 10°37′28″E﻿ / ﻿35.829783°N 10.624434°E﻿ / 35.829783; 10.624434﻿ (Hadrumentum (Sousse) Roman circus (probable location)) (probable location) 350cited in Humphrey; probable location based on information in 1903 documents (French), reinforced by an undated aerial photograph; visible length (as measured on Wikimapia based on cross-reference with aerial photograph): c350m or greater. Utica near Zana Tun-uTunisia 37°03′04″N 10°03′47″E﻿ / ﻿37.051230°N 10.063141°E﻿ / 37.051230; 10.063141﻿ (Utica Roman circus (probable location)) (probable location) 290cited in Humphrey; Tunisian archaeological site number: 007.157 (Utique ; Henchir Bechateur ; UTIKA); reference to circus; uncorroborated location; more probable location as indicated by the maps in confirms the given location; approximate length measured from the maps in: 280-300m. Hippodrome of Constantinople Istanbul Tur-bTurkey 41°00′24″N 28°58′33″E﻿ / ﻿41.006548°N 28.975961°E﻿ / 41.006548; 28.975961﻿ (Byzantium) 450Built under Septimius Severus; estimated length: c450m; estimated width: c130m; other than some monuments from the spina, virtually none of the structure is visible today; it is believed much of the structure may lie buried some 2m below the current surface. Laodicea on the Lycus Denizli (c6km) Tur-lTurkey 37°49′52″N 29°06′16″E﻿ / ﻿37.831074°N 29.104478°E﻿ / 37.831074; 29.104478﻿ (Laodicea Roman stadium) 250referred to as a stadium; double U-shaped and small; visible track length: c250m; visible track width: c40m; form clearly visible; no visible spina; unoccupied by any subsequent construction. Nicomedia İzmit Tur-nTurkey 40°46′00″N 29°55′15″E﻿ / ﻿40.766754°N 29.920744°E﻿ / 40.766754; 29.920744﻿ (Nicomedia (İzmit) Roman town (not the circus; historic nucleus of İzmit)) (not the circus; historic nucleus of İzmit) 000(location_unknown)cited in Humphrey; general information on the archaeological remains of Nicomedia; Kocaeli municipal history, including a 19th-century map showing the location of the historic nucleus of the city (through history Kocaeli has been named successively: Olbia, Astakos, Nicomedia, Iznikmid, and Izmid or Izmit); no online circus-specific information found. ↑ Michael Gagarin; Elaine Fantham, eds. (2009). The Oxford Encyclopedia of Ancient Greece and Rome, Volume 1. Oxford University Press. p. 146. ISBN 978-0-19-517072-6. 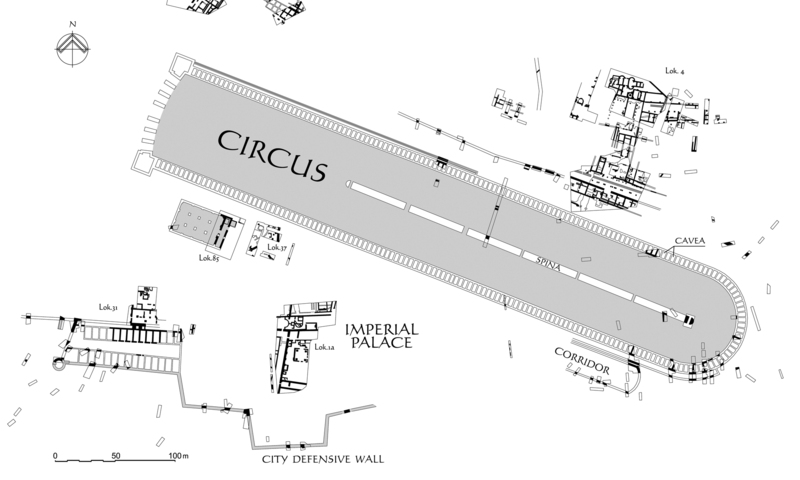 ↑ Circus Maximus#History of Construction. 1 2 [Auzia] Names of cities in Algerie in (A.D. 138) Roman times and names now from E-DZ Community | Education & Learning | Algerian History, Culture, Art, Law, Politics (order by start date; start date: 21 Dec 2008). 1 2 3 4 5 6 7 8 9 10 11 12 13 14 15 16 17 18 19 20 21 22 23 24 25 26 27 28 29 30 31 32 33 34 35 36 37 38 39 40 41 42 43 44 John H. Humphrey: Roman Circuses: Arenas for Chariot Racing. University of California Press, Berkeley and Los Angeles 1986, ISBN 0-520-04921-7. 1 2 [Cherchell] The Circus | Cherchel at circusmaximus.us. 1 2 3 4 [Setif] The Circus | Circus at Setif at circusmaximus.us. 1 2 [Trimontium] The ancient stadium of Philippopolis Track. ↑ [Trimontium] The ancient stadium of Philippopolis. 1 2 [Antinopolis] Wikimapia location: Antinopolis. ↑ [Camulodunum] THE ROMAN CIRCUS VICTRICENSIS IN COLCHESTER. ↑ [Camulodunum] Colchester Archaeological Trust. 1 2 3 [Camulodunum] Roman Circus 200 m south of Abbey House, EHER/SMR Number 46327 at Unlocking Essex's Past website from Heritage Conservation at Essex County Council. ↑ [Arelate] Cirque romain (French), at Patrimoine de la Ville d'Arles | Ville d'Arles | Barriol / Plan-du-Bourg. 1 2 [Arelate] Cirque romain d'Arles at Arles Office de Tourisme | Visit | Places to visit. 1 2 [Arelate] Cirque romain | Description (French), at Patrimoine de la Ville d'Arles | Ville d'Arles | Barriol / Plan-du-Bourg. ↑ [Arelate] Wikimapia location: Arelate. ↑ [Arelate] The Circus | Arles at circusmaximus.us. 1 2 [Lugdunum] Cirque antique de Lyon and Cirque antique de Lyon#Hypothèses de localisation (French). ↑ [Vienna] The Circus | Vienne at circusmaximus.us. ↑ [Augusta Treverorum] satellite photo from LIVIUS Articles on Ancient History | Germania Inferior | Topography | Augusta Treverorum (Trier) | Trier: Circus. ↑ [Augusta Treverorum] Wikimapia location: Augusta Treverorum Roman circus. ↑ [Augusta Treverorum] Archäologie in Trier (in German) from Universität Trier | Organisation | Fachbereiche und Fächer | Fachbereich III | Klassische Archäologie | Was | Archäologie in Trier. ↑ [Augusta Treverorum] Trier: Circus at LIVIUS Articles on Ancient History | Germania Inferior | Topography | Augusta Treverorum (Trier). ↑ [Corinth] A Roman Circus in Corinth at HighBeam Research » Publications » Academic journals » History journals » Hesperia, paper reference: David Gilman Romano, “A Roman Circus in Corinth,” in Hesperia 74, 2005, pp. 585–611. ↑ [Corinth] Figure 11. Roman Corinth, ca. 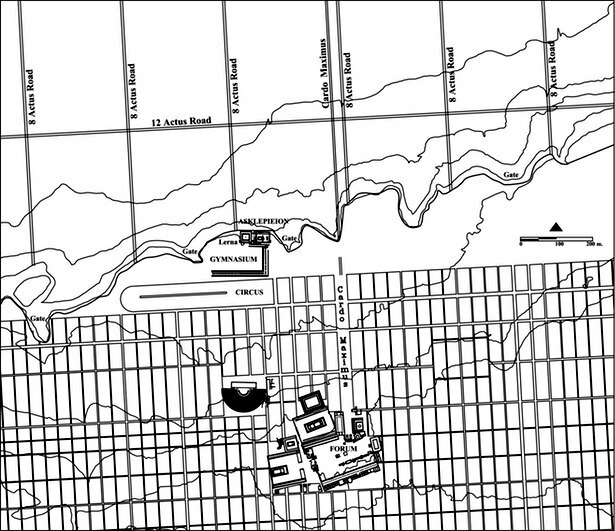 A.D. 50, and a portion of the land divided between the long walls illustrating the north-south roadways. from Corinth Computer Project | Greek and Roman Corinth | 44 BC – Colonia Laus Iulia Corinthiensis (Figure 11). ↑ [Corinth] Figure 11. Roman Corinth, ca. A.D. 50, and a portion of the land divided between the long walls illustrating the north-south roadways from Corinth Computer Project | Greek and Roman Corinth | Colonia Laus Iulia Corinthiensis, 44 BC (Figure 11). ↑ [Corinth] Wikimapia location: Corinth Roman circus (hypothesised and partially excavated location). 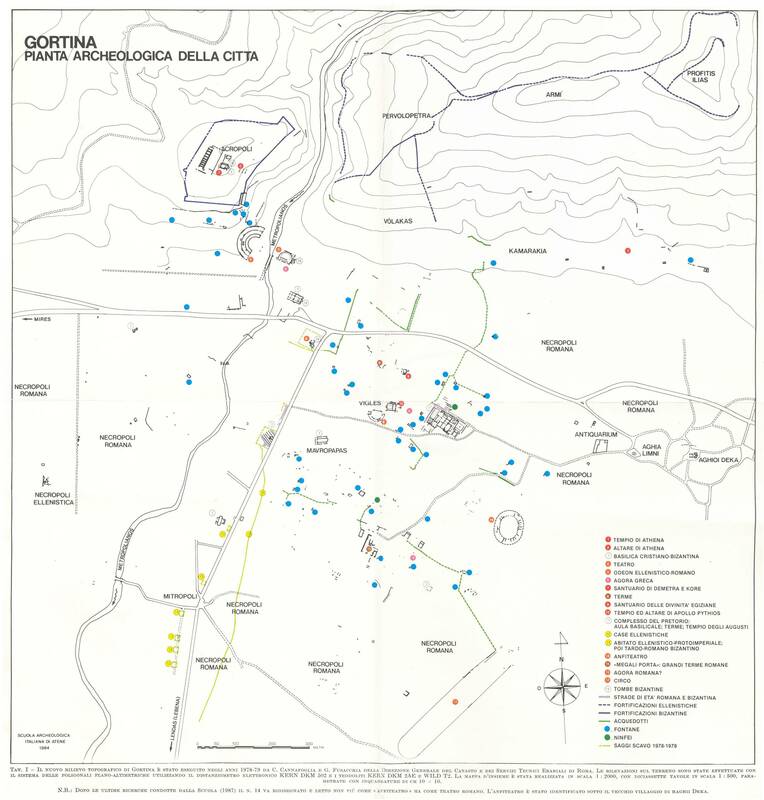 ↑ [Gortyn] Map of Gortyn (Gortina – Planta Archaeologica Dela Citta) at romanaqueducts.info | Roman Aqueducts | AQUASITE: Information on 50 selected Roman aqueducts | Gortyn(a) (Greece / Crete). 1 2 [Gortyn] Wikimapia location: Gortyn Roman circus. ↑ [Gortyn] The Circus | Circus of Gortyn at circusmaximus.us. 1 2 3 [Nicopolis] Wikimapia location: Nicopolis Roman circus. ↑ [Thessalonica] Thessalonica | Excavations at BiblePlaces.com | The Sites | Greece | Thessalonica. 1 2 [Thessalonica] Wikimapia location: Thessalonica Roman circus. 1 2 [Thessalonica] archaeological map of walled historical centre of Thessalonica. 1 2 3 [Caesarea Maritima] The Circus | Caesarea at circusmaximus.us. 1 2 [Caesarea Maritima (coastal)] Wikimapia location: Caesarea Maritima Roman circus (coastal). 1 2 [Caesarea Maritima (inland)] Wikimapia location: Caesarea Maritima Roman circus (inland). 1 2 3 4 [Aquileia] The Circus | Aquileia at circusmaximus.us. 1 2 [Aquileia] Wikimapia location: Aquileia Roman circus. 1 2 3 [Bovillae] L'antica Bovillae | Il Circo di Bovillae (Italian) at parcodibovillae.org | PROTEZIONE DELL'AREA DELL'ANTICA BOVILLAE (Italian). ↑ [Bovillae] English page | The Roman stadium of Boville at parcodibovillae.org | PROTEZIONE DELL'AREA DELL'ANTICA BOVILLAE (Italian). ↑ [Bovillae] Wikimapia location: Bovillae Roman circus. 1 2 [Mediolanum] The Circus | Milan at circusmaximus.us. ↑ [Mediolanum] Wikimapia location: Mediolanum Roman circus. 1 2 [Mediolanum] J.H.Humphrey, Roman Circuses, Londra 1986, p.614. ↑ [Mediolanum] Wikimapia location: Milan Roman circus (tower at the north western corner). ↑ [Circus Flaminius] Wikimapia location: Circus Flaminius, Rome. ↑ [Circus Flaminius] Circus Flaminius. 1 2 [Circus Flaminius] Circus Flaminius – Samuel Ball Platner, 1929, via http://penelope.uchicago.edu/ at the University of Chicago. 1 2 [Circus of Maxentius] Wikimapia location: Circus of Maxentius, Rome. ↑ [Circus of Maxentius] The Circus | Maxentius at circusmaximus.us. 1 2 [Circus Maximus] Circus Maximus#Republican era. ↑ [Circus of Nero] Wikimapia location: Circus of Nero (location of the spina obelisk until 1586). ↑ [Circus of Nero] Wikimapia location: Circus of Nero (location of the obelisk since 1586). ↑ [Circus of Nero] The Circus | Vatican Circus at circusmaximus.us. ↑ [Circus Varianus] Wikimapia location: Circus Varianus, Rome. 1 2 [Circus Varianus] Circo Variano at Italian Wikipedia. ↑ [Circus Varianus] The Circus | Varianus at circusmaximus.us. ↑ [Gadara] Gadara (Umm Quais) Topographische Bestandkarte 2007 (archaeological site map) from Research projects | geographical order | Gadara/Umm Qais (Jordanien) at Deutsches Archäologisches Institut (DAI). ↑ [Gadara] Wikimapia location: Gadara hippodrome. 1 2 [Gerasa] Wikimapia location: Gerasa Roman circus. ↑ [Gerasa] The Circus | Gerasa at circusmaximus.us. ↑ [Berytus] Wikimapia location: Colonia Iulia Augusta Felix Berytus Roman hippodrome. 1 2 [Tyrus] Wikimapia location: Tyrus Roman circus. ↑ [Tyrus] The Circus | Tyre at circusmaximus.us. 1 2 [Cyrene] Wikimapia location: Cyrene Roman circus. 1 2 3 [Cyrene] The Circus | Circus at Cyrene at circusmaximus.us. 1 2 [Leptis Magna] Wikimapia location: Leptis Magna Roman circus. ↑ [Leptis Magna] The Circus | Leptis Magna at circusmaximus.us. ↑ [Aeminium] Aeminium at Museu Nacional de Machado de Castro | English Version. ↑ [Aeminium] Aeminium Archived January 21, 2012, at the Wayback Machine. (in Portuguese), at Museu Nacional de Machado de Castro | Mini-Sítios. ↑ [Aeminium] Wikimapia location: suggested location for Aeminium Roman circus. 1 2 3 [Balsa] O Urbanismo de Balsa Romana (from 8:50; dimensions given at 9:11) at Campo Arqueológico de Tavira. 1 2 [Miróbriga] Wikimapia location: Miróbriga Roman circus. ↑ [Miróbriga] The Circus | Circus of Mirobriga at circusmaximus.us. ↑ [Olissipona] A Cronologia do Circo de Olisipo by IPPAR (now IGESPAR); published as: Revista Portuguesa de Arqueologia. volume 5. número 2. 2002, pp 245–275, "A Cronologia do Circo de Olisipo: a Terra Sigillata", Eurico Sepúlveda and others. 1 2 [Sirmium] archaeological plan of Roman Sirmium from Sirmium Palatium Imperiale at Carska Palata Sirmium. 1 2 [Sirmium] Sirmium#Archeological findings. ↑ [Calagurris] Cidade | Turismo | Monumentos | Arqueología Romana at Ayuntamiento de Calahorra. ↑ [Calagurris] Wikimapia location: Calagurris Roman circus. ↑ [Cáparra] Wikimapia location: Cáparra Roman circus. ↑ [Cáparra] Cáparra at Spanish Wikipedia. 1 2 [Corduba] Wikimapia location: Corduba Roman circus. 1 2 [Corduba] Cordoba Roman circus at Artencordoba.com | Roman Córdoba (see also: plan of Roman Cordoba; and: detailed location map of the circus). 1 2 [Emerita Augusta] Wikimapia location: Emerita Augusta Roman circus. ↑ [Emerita Augusta] The Circus | Emerita Augusta at circusmaximus.us. ↑ [Italica] Roman sites by list | Spain | Italica at Imperium Roman sites. ↑ [Saguntum] Wikimapia location: Saguntum Roman circus. ↑ [Saguntum] Roman sites by list | Spain | Sagunto at Imperium Roman sites. ↑ [Saguntum] Wikimapia location: Saguntum Roman circus (excavated gate). 1 2 [Saguntum] Wikimapia location: Saguntum Roman circus (information, including dimensions, in Spanish). ↑ [Saguntum] The Circus | Segunto at circusmaximus.us. 1 2 [Tarraco] Roman Art | Public Spectacles architecture | Circus of Tarraco in Tarragona | Roman Circus of Tarraco, at Tarragona at SpanishArts.com. ↑ [Tarraco] The Circus | Tarragona at circusmaximus.us. 1 2 [Toletum] The Circus | Toledo at circusmaximus.us. ↑ [Toletum] Wikimapia location: Toletum Roman circus. ↑ [Toletum] Wikimapia location: Toletum Roman circus (curved end). 1 2 [Zafra] Zafra#Roman era (article accessed: 2012-03-01). ↑ [Bostra] Plan de l'Ancienne Ville de Bosra montrant l'emplacement de tous les monuments connus. B&W, 37 x 25 cm, scale by approximation ~ 1:6,100. Shows in red the boundaries of the site at UNESCO | Ancient City of Bosra. ↑ [Bostra] Plan de Bosra (circus identified as a hippodrome) from In-Depth History | Plan of the City | Plan of the City at Bosracity.com | English. 1 2 [Bostra] Wikimapia location: Nova Trajana Bostra Roman circus. ↑ [Bostra] The Circus | Bostra at circusmaximus.us. 1 2 [Abthugni]+[Commodum (as: Mun. Aur. Comm.)] map from DocArtis | Progetti | TUNISIA: Projet de gestion du patrimoine culturel | Bibliografie | B0000018 | Pflaum H. G., Romanisation de l'ancien territoire de la Carthage punique; The full article and map can be found from: Pflaum H. G., "Romanisation de l'ancien territoire de la Carthage punique" - in Antiquités africaines, 4, 1970. pp. 75-118. 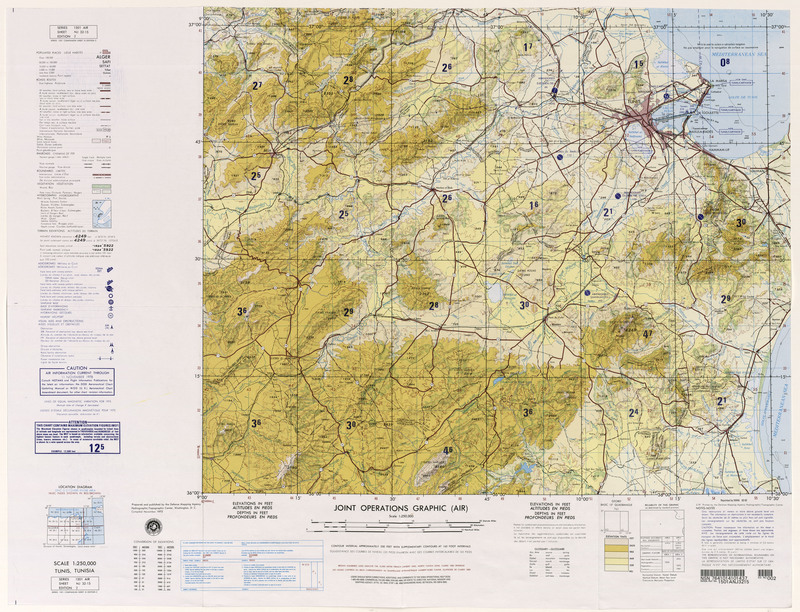 (the full map is on the last page; a high resolution version of the complete map may be obtained by using the scaling facilities of the site to enlarge the map, and then saving the resulting image). ↑ [Abthugni] Barrington Atlas of the Greek and Roman World, Edited by Richard J. A. Talbert, Map 32 Carthago; textual directory to map available from: http://press.princeton.edu/B_ATLAS.ZIP | BATL032_.PDF (reference to Abthugni and Henchir-es-Souar on directory page 494 (PDF page 2)). 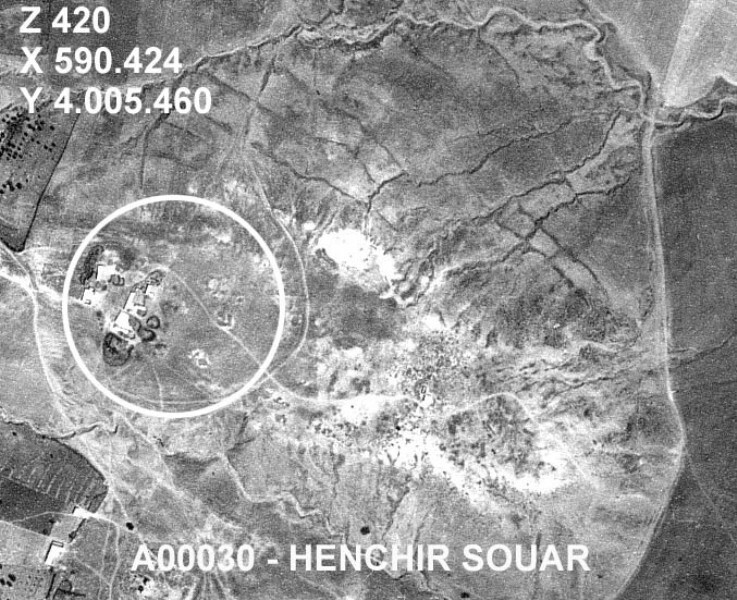 1 2 [Abthugni] Hennchir Kasbat es Souar: Tunisia, SOURCE: National Geospatial-Intelligence Agency, Bethesda, MD, USA. 1 2 [Abthugni (as: 'Ruins' at ref: NJ 32-15/510322)]+[Commodum (as: 'Henchir Boucha (ruins)' at ref: NJ 32-15/498358)] on map: NJ 32-15 Tunis, Tunisia from Perry-Castañeda Library Map Collection | Tunisia Maps | Algeria, Morocco and Tunisia, Joint Operations Graphic 1:250,000. ↑ [Abthugni] ZAGHOUAN (search for 'A00030'), from Docartis | Tunisia | Patrimonio archeologico e storico | Siti complessi e monumenti | Gestion du patrimoine culturel de la Tunisie - Liste des monuments et décrets par gouvernorat (search for 'Zaghouan'). ↑ [Abthugni] Décret du 13 mars 1912 (24 rabia-el-aoual 1330), page 2 (search for 'Henchir Souar'), from Docartis | Tunisia | Patrimonio archeologico e storico | Decreti di protezione | Liste Decrets (search for '14, Décret du 13 mars 1912 (24 rabia-el-aoual 1330)' | Décret du 13 mars 1912 (24 rabia-el-aoual 1330). ↑ [Abthugni] aerial photograph from Docartis | Tunisia | Fonti documentarie | Foto aeree | PHOTOS AERIENNES (search for 'Henchir Souar, A00030'). ↑ [Abthugni] Wikimapia location: Henchir Souar. 1 2 3 4 [Carthago] The Circus | Carthage Circus at circusmaximus.us. 1 2 [Carthago] Wikimapia location: Carthago Roman circus. ↑ [Hadrumetum] Wikimapia location: Sousse Roman circus (probable location). 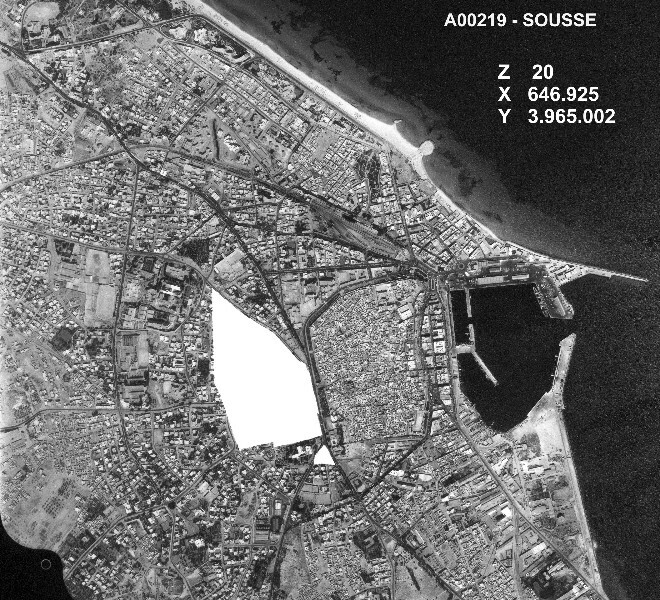 ↑ [Hadrumetum] aerial photograph of Sousse from DocArtis | Progetti | TUNISIA: Projet de gestion du patrimoine culturel | Fonti documentarie | Foto aeree | PHOTOS AERIENNES | Sousse ville. | A00219. ↑ [Thugga] Wikimapia location: Thugga Roman circus (approximate location). ↑ [Thugga] Délimitation du site culturel de Dougga. A3. Scale by calculation ~ 1: 6,250. Shows boundaries and buffer zone of the World Heritage property from UNESCO » Culture » World Heritage Centre » The List » World Heritage List » Dougga / Thugga » Maps. ↑ [Thugga] THE GERMAN-TUNISIAN PROJECT AT DOUGGA FIRST RESULTS OF THE EXCAVATIONS SOUTH OF THE MAISON DU TRIFOLIUM (page 47). ↑ [Thugga] PlanetWare.com > Africa and the Middle East > Tunisia > Tunisia Tourist Attractions > Dougga Tourist Attractions | Circus. ↑ [Thugga] The Circus | Dougga at circusmaximus.us. 1 2 [Thysdrus] Wikimapia location: Thysdrus Roman circus. ↑ [Thysdrus] The Circus | El Djem at circusmaximus.us. ↑ [Utica] Cahier Ghar el Melh (NO-SO) from Institut National du Patrimoine Tunisie | Archaeological Map | Carte National des Sites Arqueologiques e des Monuments Historiques | 007 Ghar el Melh. ↑ [Utica] Utica, Tunisia at British School at Rome » Accademia Britannica di Archeologia, Storia e Belle Arti » Research » Archaeology » Geophysics » Geophysics Projects (search for 'Utica, Tunisia'). ↑ [Utica] Wikimapia location: Utica Roman circus (uncorroborated). ↑ [Utica] Wikimapia location: Utica Roman circus (probable). 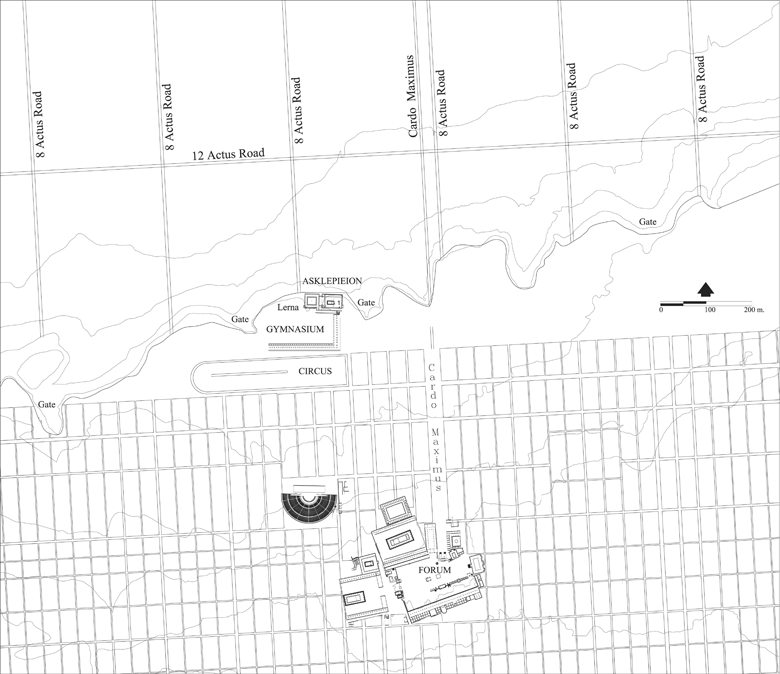 1 2 [Utica] 'Survey and Excavation at Utica 2010' by Nabil Kallala, Elizabeth Fentress, Josephine Quinn, Andrew Wilson (maps on pages 11 and 12). 1 2 3 4 5 [Antioch] The Circus | Antioch at circusmaximus.us. 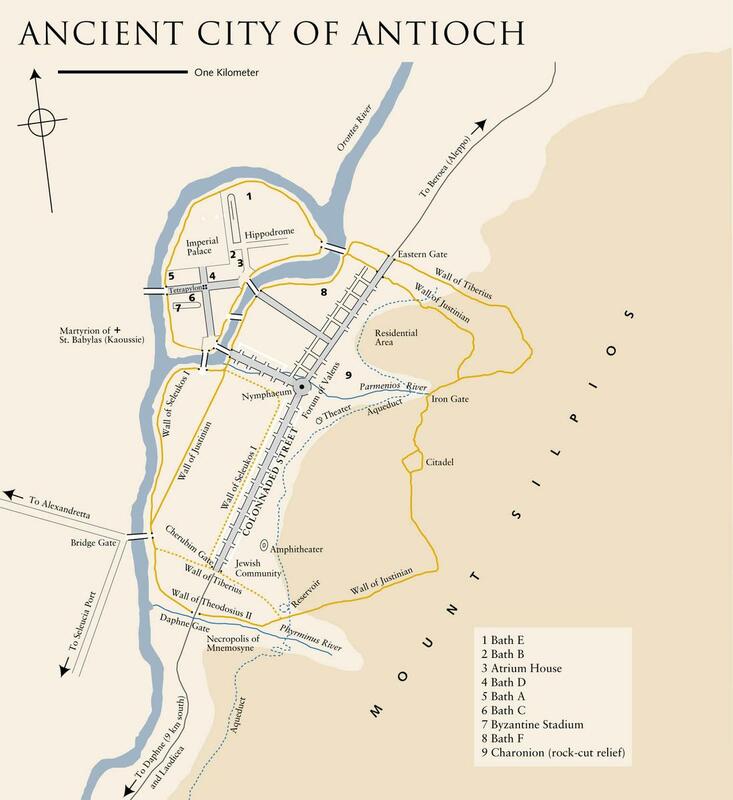 ↑ [Antioch] map Ancient City of Antioch Archived December 30, 2005, at the Wayback Machine. from a past exhibition at the The Cleveland Museum of Art. ↑ [Antioch] Wikimapia location: ancient city of Antioch. 1 2 [Antioch] Wikimapia location: Antioch Roman hippodrome. 1 2 [Aphrodisias] Wikimapia location: Aphrodisias Roman circus/hippodrome/stadium. ↑ [Aphrodisias] The Circus | Aphrodisia at circusmaximus.us. 1 2 [Byzantium] Hippodrome of Constantinople#History and use. ↑ [Byzantium] Hippodrome of Constantinople#The Hippodrome today. ↑ [Byzantium] The Circus | Constantinople at circusmaximus.us. 1 2 [Laodicea on the Lycus] Wikimapia location: Laodicea on the Lycus Roman stadium or circus. ↑ [Nicomedia] The Princeton Encyclopedia of Classical Sites | NICOMEDIA NW Turkey at Perseus Digital Library | Collections/Texts | Perseus Collection | Greek and Roman Materials (search for 'The Princeton Encyclopedia of Classical Sites'). ↑ [Nicomedia] KocaeLi - information on historical remains at Izmit (ancient Nicomedia). ↑ [Nicomedia] Kocaeli Metropolitan Municipality | History of Kocaeli. Wikimedia Commons has media related to Ancient Roman circuses.